Many surfers today have an SUP Board – short for Stand Up Paddle – in their board quivers. For the newcomer or non-surfer, buying one doesn’t have to be intimidating. Started a few years ago by already-legendary surfer Laird Hamilton and his Maui surf buddies, SUP, or Stand Up Paddling, has swept the surfing world as an alternative to conventional wave riding. 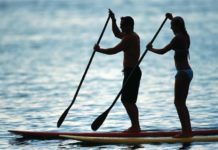 Based on a traditional Hawaiian pastime and the practice of Waikiki beach boys of paddling rental boards around the bay, SUP has become a specialized niche of surfing. SUP Boards Vary According to Use and a Buyer’s Weight and Ability. 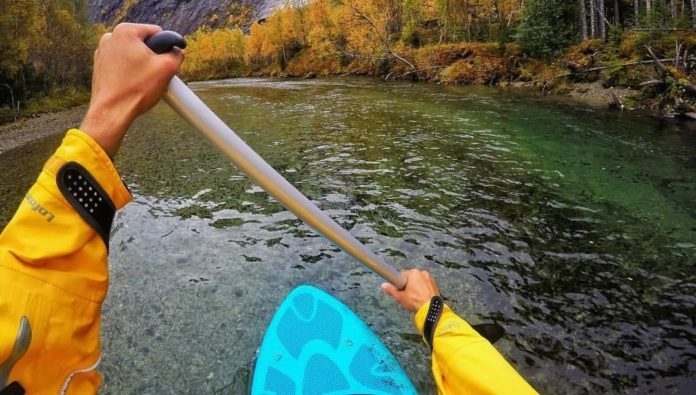 In fact, SUP boards now can be seen on lakes and rivers around the USA and the world. 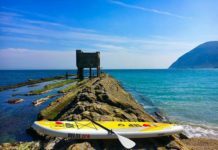 This has brought in a new wave of paddlers who have never been on a traditional board, but who have taken to SUP for its novelty, its adventure, and a great core work-out. Whether one intends to paddle on the nearby lake or ride waves in the ocean, buying a board can be confusing. 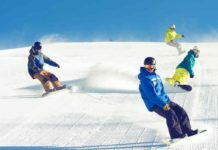 Here are a few guidelines for buying just the right board for one’s usage, ability, and body weight. Generally, the best “first” SUP board should be big enough to amply float the rider in flat water. Coastal paddlers will usually want a board that performs in the surf, too. Smaller, surf-specific boards perform better in waves than bigger general-use boards, but they can be finicky and they require advanced SUP skills. 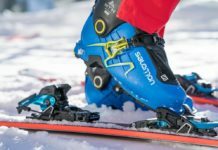 Most manufacturers provide useful on-line charts detailing each board’s intended use and rider weight and ability; these should be studied carefully. What Is the Best Size for an SUP Board? Surfing longboards usually run in the 9 to 10 foot range. A big longboard, or “log,” might be 10 feet long, 23 inches wide, and 3 inches thick, designed to make the most of small surf. A typical multi-purpose SUP board will be much bigger: 11 or 12 feet long, 30 inches wide, and 4 to 5 inches thick. 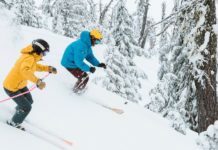 The primary consideration is the rider’s weight, but most experienced SUPers agree that a board 11 to 12 feet in length is a good place to begin. This size board will float riders that range from fairly small (including kids) to 220 pounders and up. Lighter riders, say in the 150 pound range, can get away with a smaller board, one in the range of 10 1/2 to11 feet long and 4 inches thick. A board of this size would also work in the surf for a more advanced rider. Generally, a shorter board is for a lighter rider or one with more advanced skills. The same board may work in different ways for different riders. Many SUPers crossing over from surfing, who are confident that their skills will improve, buy a shorter board that they can grow into as they progress – a little more difficult at first, but better board performance later. Rocker, which is how much a board curves upward from nose to tail when viewed from the side, has lots to do with surfboard performance. An SUP board with lots of rocker will turn well in the surf, but it may be slow in flat water. Flatter boards, without much rocker, glide well in flat water but may be hard to turn in waves. So the buyer should read each manufacturers claims and specs carefully. Good builders are careful to document their boards’ characteristics; they’d rather sell a buyer the right board than hear later that it didn’t perform as expected. Most SUPs come with a single fin or a 2 plus 1 set-up, a single medium-sized fin in the middle with smaller “side-bites” along the rails. Multiple fins tend to loosen a board up in the surf, but a single fin will work fine for most riders. Many SUPs come with additional features that can be custom ordered or, more and more frequently, added later. For many paddle-surfers, the first addition to an SUP board is a soft non-slip deck traction pad. A pad makes the board more comfortable and protects the deck from small impacts and pressures. 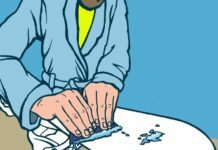 Even more important to many, it means the rider doesn’t have to use traditional surfboard wax, so the deck stays neat and clean. Deck pads, which come in a variety of shapes and colors, can cost $100 or more. The most valuable add-on is probably a carrying handle. Without a handle, the most strenuous part of a session can be carrying the large, bulky board across the beach to the water. While some handles can be added after-market, the handle is usually nothing more than a small channel for the fingers placed at the board’s center of gravity and, thus, cannot be added later. Most boards today come with handles; if not, a good surf shop can add one for $50 or so. For windsurfers, a mast-track is essential if one wants to sail the board. Many sailboard companies include a mast track on their boards, but it may be nearly impossible to get one on a board made by a surfboard company. Gear tie-downs are also available on some flat-water boards. The paddle should be 7 to 9 inches longer than the rider’s total height. Paddles range from wood, fiberglass, and even plastic at the low end (approx. $100) to carbon and bamboo ($250 to 400). A lighter paddle will be easier for the rider to use and also easier on the boards’ rails, which it tends to bounce off from time to time. Many SUPers opt for an inexpensive paddle with a package deal on their boards, then invest in a more exotic paddle later. The range of styles and shapes in paddles is as extensive as that of boards, and usually requires just as much research.